"Appfortel, the Russian developer of mobile applications is proud to announce the release of a unique Beta-version service for organizing your contacts – LiveContacts – in mid-summer 2011. The LiveContacts application will contain a number of functions aimed at livening up your address directories and supporting the contacts in your phonebook in an actual and “animated” way. Today, from hundreds to thousands of contacts are stored in phonebooks of large megacities’ representatives. Many of them quickly become outdated – time has an impact on all kinds of information. Changes can be observed in surnames, workplaces, addresses, jobs and positions, telephone numbers, and other contact data." A new way in presenting your contacts (Livening them up!) is on its way to you from "Appfortel" LLC, a Russian start-up who wants to breathe life into the staid contact apps on a number of handset platforms, namely Windows Mobile, Android, iOS & Symbian. I contacted Denis Pushkar to confirm whether their Press Release was correct with Windows Mobile, and it is. It looks like the Appfortel code warriors are giving some love back to the Windows Mobile device users; Windows Phone 7, at this point, is not getting the App. The service and respective platform apps are due to start appearing around the end of July. I still have my Omnia II hiding in the paper tray on my desk. I may just, get a chance, to Liven it up with LiveContacts when released. The scant details hint that a web service is used, and pulling contact details like contact linking on WP7. More details when Appfortel's website goes "Live" soon, here and here. The remainder of the press release is after the break. Contact Synchronization – LiveContacts saves your contacts (backup) and synchronizes them with devices based on iOS, Android, Windows mobile and Symbian. Synchronization with Windows, Mac, and Linux will be available in the future. Live Contacts – your contact’s photograph, his/her contact and personal information, as well as the status and news from friends and acquaintances are updated automatically. 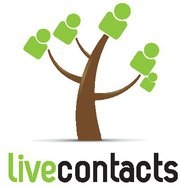 Contact Search – you can search for new contacts among individuals and organizations registered in LiveContacts. Advanced search according to professions, social status, and other information will also be available. Your contacts exist and can communicate with each other, generating a 100% understanding of who is who in your own phonebook."